The stack model that ADAM is based upon was introduced in (Massie et al. 2013) and further refined in (F. A. Nothaft et al. 2015), and is depicted in the figure below. 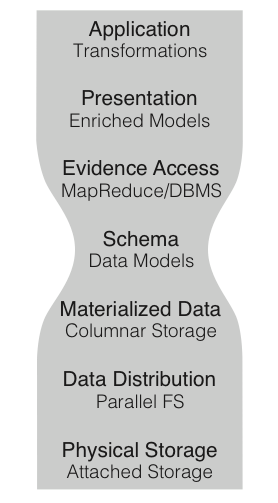 This stack model separates computational patterns from the data model, and the data model from the serialized representation of the data on disk. This enables developers to write queries that run seamlessly on a single node or on a distributed cluster, on legacy genomics data files or on data stored in a high performance columnar storage format, and on sorted or unsorted data, without making any modifications to their query. Additionally, this allows developers to write at a higher level of abstraction without sacrificing performance, since we have the freedom to change the implementation of a layer of the stack in order to improve the performance of a given query. The physical storage layer is the type of storage media (e.g., hard disk/solid state drives) that are used to store the data. The data distribution layer determines how data are made accessible to all of the nodes in the cluster. Data may be made accessible through a POSIX-compliant shared file system such as NFS (Sandberg et al. 1985), a non-POSIX file system that implements Hadoop’s APIs (e.g., HDFS), or through a block-store, such as Amazon S3. The materialized data layer defines how the logical data in a single record maps to bytes on disk. We advocate for the use of Apache Parquet, a high performance columnar storage format based off of Google’s Dremel database (Melnik et al. 2010). To support conventional genomics file formats, we exchange the Parquet implementation of this layer with a layer that maps the given schema into a traditional genomics file format (e.g., SAM/BAM/CRAM, BED/GTF/GFF/NarrowPeak, VCF). The schema layer defines the logical representation of a datatype. The evidence access layer is the software layer that implements and executes queries against data stored on disk. While ADAM was originally built around Apache Spark’s Resilient Distributed Dataset (RDD) API (Zaharia et al. 2012), ADAM has recently enabled the use of Spark SQL (Armbrust et al. 2015) for evidence access and query. The presentation layer provides high level abstractions for interacting with a parallel collection of genomic data. In ADAM, we implement this layer through the GenomicRDD classes. This layer presents users with a view of the metadata associated with a collection of genomic data, and APIs for transforming and joining genomic data. Additionally, this is the layer where we provide cross-language support. The application layer is the layer where a user writes their application on top of the provided APIs. Our stack model derives its inspiration from the layered Open Systems Interconnection (OSI) networking stack (Zimmermann 1980), which eventually served as the inspiration for the Internet Protocol stack, and from the concept of data independence in database systems. We see this approach as an alternative to the “stack smashing” commonly seen in genomics APIs, such as the GATK’s “walker” interface (McKenna et al. 2010). In these APIs, implementation details about the layout of data on disk (are the data sorted?) are propagated up to the application layer of the API and exposed to user code. This limits the sorts of queries that can be expressed efficiently to queries that can easily be run against linear sorted data. Additionally, these “smashed stacks” typically expose very low level APIs, such as a sorted iterator, which increases the cost to implementing a query and can lead to trivial mistakes.